Jenny Duncalf: Suffered a surprise first round defeat at the British Open in Hull. The 28-year-old world No 22 spent 84 minutes on court before finally overcoming Egypt’s Zahed Mohamed - ranked just seven places below him in the PSA world rankings 11-5, 12-14, 11-9, 9-11, 11-7. Nick Matthew eased through to the second round with a 3-0 win over Adrian Waller. “It was a really, really tough match,” said Simpson. “I felt pretty comfortable in the first game and a half. After that though he stopped me from playing my game and I never felt comfortable again in the match. I’m really happy to win because I don’t think I was necessarily the better player out there on court. 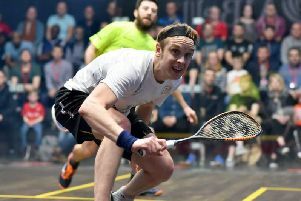 Elsewhere, Sheffield’s Nick Matthew, seemed unhindered from the injury which forced him to withdraw in the final of the recent Windy City Open when he eased past Adrian Waller in his first round tie. The 35-year-old world No3 - a three-time winner of the event - won 11-7, 11-4, 11-8 will now face Egypt’s Ali Farag in the second round on Wednesday evening after he defeated wild card entrant Tom Richards from Guildford 11-6, 11-6, 11-5. “I’ve had slightly different preparation for this tournament as I went on holiday last week which is unusual for me,” said Matthew. “I was ill here two years ago and last year I was injured so I figured I’d go somewhere to avoid getting ill and getting injured. Freshness was key, I was training while I was away but I was nervous about how I’d pitch up today – fortunately I started quite well. Two-time finalist James Willstrop, from Harrogate, begins his campaign on Tuesday night in a tricky tie against Egypt’s Tarek Momen, seven places above world No 13 Willstrop in the rankings. There was despair for Harrogate’s Jenny Duncalf in the women’s draw when she was defeated at the first hurdle by Hong Kong’s Liu Tsz-Ling. Currently 22 places below Duncalf at No 38 in the world rankings, the 24-year-old qualifier beat the 2008 finalist 13-11, 11-8, 4-11, 11-7 in 35 minutes.